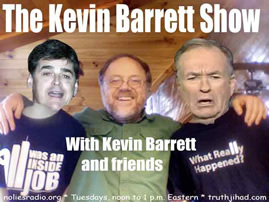 This show was broadcast April 2, 2013. 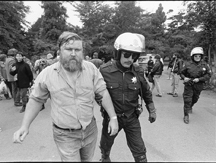 Today’s show features two activists who aren’t afraid to create a public disturbance if there’s a good reason to do so. 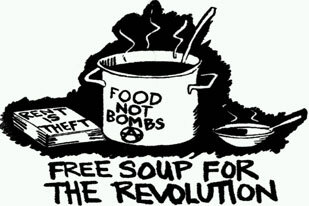 Keith McHenry, founder of Food Not Bombs, has been beaten up, kidnapped, and tortured by police more times than he can count…all for the crime of – get this – giving away food to hungry people! Rather than be discouraged by this unfriendly official reception, Keith has correctly surmised that it means he must be doing something right. Kansas City mayoral candidate Derron Black, like Keith, doesn’t shrink from public confrontation. 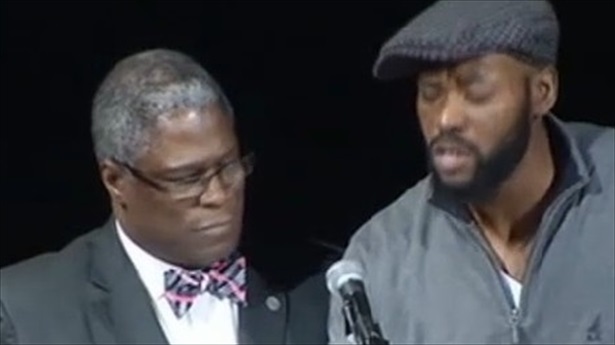 Derron made national news on Tuesday, March 19th when he “occupied” the stage and took the microphone away from KC mayor “Sly” James. Derron Black then announced his run for mayor, and was immediately endorsed by Occupy Kansas City, the American Muslim Political Action Committee (AMPAC), and other supporters. Derron, whose Muslim name is Shahid Abdullah, is a member of AMPAC and a co-organizer of the 9/11/2013 Million American March Against Fear, formerly known as the Million Muslim March. This entry was posted on Tuesday, April 2nd, 2013 at 7:57 am	and is filed under Disaster Capitalism, Freedom, Justice, Kevin Barrett, News, Protest, War Crimes. You can follow any responses to this entry through the RSS 2.0 feed.